2 How to choose a good Turk (CEZVE)? 3 How to make coffee in Turku? 4 What secrets are there in the cooking of coffee in Turku (Cezve)? Turk or pots - it is quite a handy thing, if not at home coffeemakers. Some even prefer to all coffee makers Turk, rightly believing, that is it creates a very unique and delicious coffee in the Eastern. It is believed, that since the introduction of the beverage from the roasted ground beans of coffee before the first pots, many years passed. 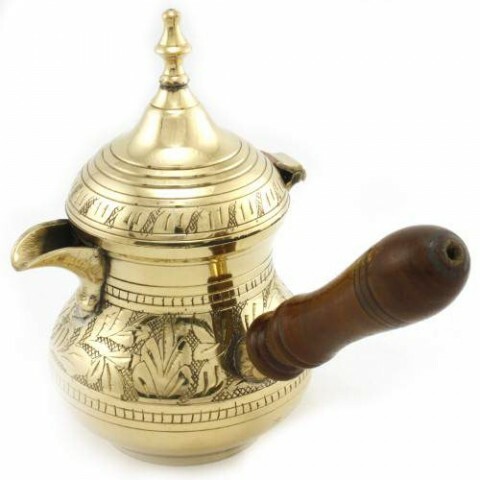 Arabs, came to love to drink coffee, for its preparation used small teapots with spouts, long handle and lid, which was heated on a hearth fire or fire. This was the prototype of our modern pots or Turks. Over time, the pots lost cover, It acquired its final form, neck was narrower. Besides, in Russia it was given the name "Turk" which has become more common, and there was a consonance with drink, ie "Turkish coffee", which it prepared. How to choose a good Turk (CEZVE)? Today, manufacturers offer the Turks of different materials: copper, ceramic, steel, clay, large and small sizes, with more narrow and wide neck. How to choose a Turk, where coffee will be the most delicious? The principle of good Turks in, that it must be of a sufficiently heat-conducting material, but with a thick bottom, comfortable, preferably with protected from heat and normally curved handle, rather broad nose, Do not spill coffee to the cup by. The perfect size - single serve coffee, better to cook a cup of coffee separately to each person. What material is better for Turks? Metal - the most suitable material for the manufacture of utensils for cooking, coffee. It's very convenient to wash, it is durable, It will not crack during heating, teploprovodnыy. Despite, Turks are made of steel, aluminum, bronze, and even silver, it is better to give preference copper. At a copper Turks should be thick bottom, that it keeps the temperature and slowly heated, which is ideal for coffee. Besides, internal walls should be covered with a food tin, which will not get harmful substances in the drink. The conical shape It helps the beautiful grounds and settling obtaining pure froth without coffee particles. Interestingly, in Turkey prefer to make pots with a wide neck, because it is believed, so it produces more beautiful crema, called in the Arab world, "the soul of coffee". How to make coffee in Turku? To get a tasty coffee, you need to select quality grain or ground coffee. Pay particular attention to its crush. For Turks recommended the so-called super-tonkij crush, when the coffee recalls powder or flour. 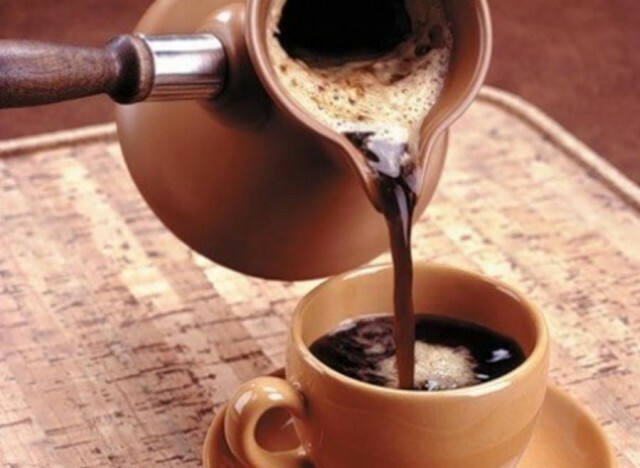 On this depends the wonderful aroma and taste of coffee in the Eastern, Fascinated by the world. A small cup required teaspoon ground coffee, 100 ml. water, 1-2 ch.l. Sahara (optional). Turku slightly warm up, pour ground coffee very fine grinding and fill cold clean, best spring water, without adding to the brim, while leaving room for foam top. Turk put on the smallest fire, gradually bringing to near boiling, until that moment, when the foam begins to rise up. Remove from the heat and stir, a couple of times we repeat this procedure, and coffee can be poured into a cup. At first we put the foam with a spoon, then pour the coffee. What secrets are there in the cooking of coffee in Turku (Cezve)? To cook a delicious coffee in Turku, recommend adding to coffee a few crystals of salt before pouring water. Often at the same time, add spices to taste: ginger, cinnamon cardamom, pepper. Interesting taste with hints of caramel will, if the Turk put a little sugar, gently heat it in the fire, then add the coffee, water and brew coffee according to the recipe above. Never bring it to boiling coffee, it was hopeless ruin. Before you pour the coffee in the cup, wait a bit, literally half a minute, for better infusion. To precipitate the foam during cooking, some are added in Turk some ice or cold water.